Listen, do you smell something? Let's forget all about that unnecessary Ghostbusters remake with the terrible CGI ghosts and pop in a few Member Berries to take our nostalgic minds back to 1984 when the original Ghostbusters wowed us all with real, er, practical ghosts like the infamous floating blob, Slimer. Well, now you too can get slimed anytime you want when you unleash this cool new NECA Lifesize Ghostbusters Slimer into your home or hotel ballroom. 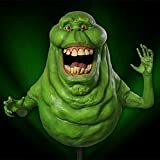 This three foot tall focused, non-terminal repeating phantasm or class 5 full roaming vapor isn't made from pure Ectoplasm, he's been re-created from realistically hand-painted foam rubber and latex from the original movie molds of the prop Slimer himself. While it may not be a real live ghost, you should probably keep this hungry green spirit away from the refrigerator just as a precaution.